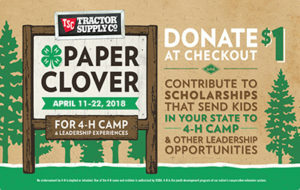 Starting on April 11, you can purchase a $1 clover at the checkout of your local Tractor Supply Company (TSC) store as part of the spring 4-H Paper Clover Campaign. The nationwide campaign ends on April 22 and the funds will support 4-H leadership experiences. The 4-H Paper Clover Campaign, held biannually in the spring and fall since 2010, takes place at TSC stores across the nation and has raised over $11 million for National 4-H Council and local 4-H programs. In Michigan, this close partnership between 4-H and TSC has allowed Michigan 4-H to raise $50,625 of the $981,000 raised nationally in the fall 2017 campaign. For every $1 clover purchased, 70 cents supports county 4-H programs; 10 cents supports 4-H volunteer and teen leadership training workshops; 5 cents will go to state 4-H programs; 5 cents will go to the Michigan 4-H Foundation and 10 cents to National 4-H Council for underwriting the cost of the program. All funds donated make it possible for more youth to experience 4-H’s youth-led, hands-on programming. To learn more about the campaign, visit www.tractorsupply.com/4-H. The Michigan 4-H Foundation is a 501(c) (3) nonprofit organization that supports Michigan 4-H Youth Development. For more information about the Michigan 4-H Foundation, visit https://www.mi4hfdtn.org. Michigan 4-H Youth Development is the youth-serving program of Michigan State University Extension. For more information about Michigan 4-H, visit www.4h.msue.msu.edu. National 4-H Council is the private sector, nonprofit partner of 4-H National Headquarters located at the National Institute for Food and Agriculture within the U.S. Department of Agriculture. Learn more about 4-H at www.4-H.org. Tractor Supply Co. operates more than 1,600 stores in 49 states. TSC stores are focused on supplying the lifestyle needs of farmers and ranchers. For more information on TSC, visit www.TractorSupply.com.